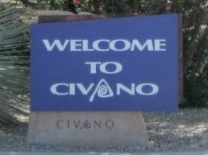 Civano Subdivision Tucson AZ is an 820 acre Master Planned Community on the Southeast side of Tucson. Civano Subdivision was designed and developed to promote economic growth within important social values and ecological harmony. The subdivision is named after the Hohokam civilization. A people that exhibited a balance between natural resources and human needs. Civano subdivision clusters commercial, cultural and civic activity in the village center. This creates a “small” town feel. Homes and community buildings use technology to achieve an ecological balance. Passive solar systems reduce energy costs. Harvested or reclaimed water is used to irrigate vegetation and conserve potable water. Solid waste recycling reduces landfill use. Tree lined biking and walking paths run throughout the community. These amenities reduce auto use and air pollution. Convenient markets, offices, and parks allow residents to shop, work and play near home. This is intended to reduce the costs and side effects of auto dependence. The Community of Civano has established 3 principles to direct its development. Create a sense of place that fosters community and connects people to one another and their natural environments. Tread lighter on the land through innovative design. Introduce sustainable construction materials and new technologies to advance the quality of life. Civano Subdivision Tucson set aside 35 percent of the community for natural or enhanced open space. Orchards, parks, trails, bike paths, recreational facilities, and preserved desert wildlands are a part of the community. Learn more about Civano Subdivision and the “Smart Communities Network“. Moving to Tucson OR Looking for Homes In Tucson For Sale? We Can Help! Questions about the Tucson Real Estate Market or Civano Tucson Homes for Sale? Call Us 520.940.4541 OR complete the – CONTACT FORM – and we will get right back to you!